اکبرزاده, عباس, وخشوری, مریم, جمشیدی, شروین, خالصی دوست, مرتضی. (1393). بررسی عملکرد گیاه وتیور در حذف مواد مغذی از فاضلاب. مجله آب و فاضلاب, 26(1), 57-67. عباس اکبرزاده; مریم وخشوری; شروین جمشیدی; مرتضی خالصی دوست. "بررسی عملکرد گیاه وتیور در حذف مواد مغذی از فاضلاب". مجله آب و فاضلاب, 26, 1, 1393, 57-67. اکبرزاده, عباس, وخشوری, مریم, جمشیدی, شروین, خالصی دوست, مرتضی. (1393). 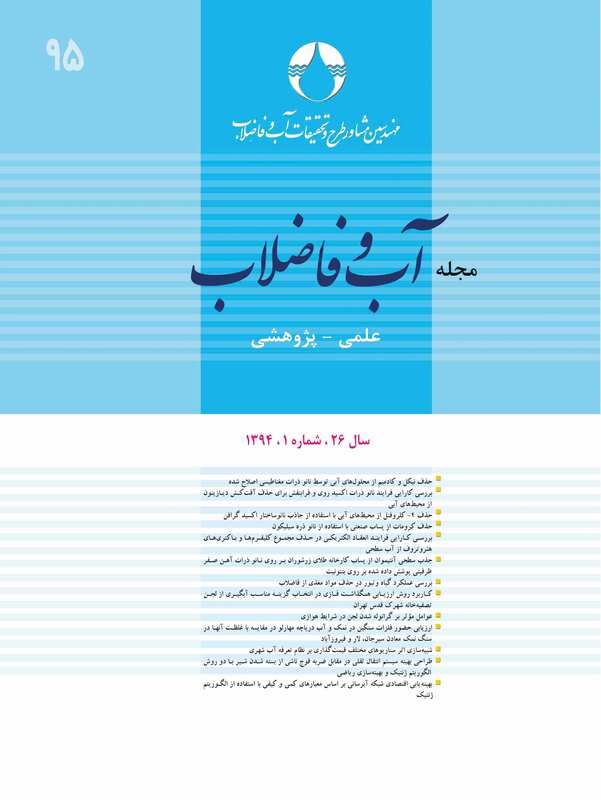 'بررسی عملکرد گیاه وتیور در حذف مواد مغذی از فاضلاب', مجله آب و فاضلاب, 26(1), pp. 57-67. اکبرزاده, عباس, وخشوری, مریم, جمشیدی, شروین, خالصی دوست, مرتضی. بررسی عملکرد گیاه وتیور در حذف مواد مغذی از فاضلاب. مجله آب و فاضلاب, 1393; 26(1): 57-67. هدف از این پژوهش، امکان‌سنجی رشد گونه گیاهی وتیور به‌صورت هیدروپونیک در محیط پساب و ارزیابی میزان حذف و پالایش ترکیبات مغذی (نیتروژن و فسفر) در این شرایط بود. به این منظور، پایلوتی با حجم مفید 60 لیتر ساخته شد و به‌مدت سه ماه به‌طور هفتگی و ناپیوسته از پساب خروجی تصفیه‌خانه فاضلاب شهرک غرب تهران تغذیه شد. نتایج حاصل نشان داد که گیاه وتیور می‌تواند در این شرایط، رشد قابل ملاحظه‌ای (تا 130 سانتی‌متر) داشته باشد. همچنین به‌طور متوسط کارآمدی حذف ترکیبات نیتروژن کل، فسفر کل و میزان اکسیژن‌خواهی بیوشیمیایی در زمان ماند 4 روزه به‌ترتیب 91، 97 و 75 درصد بود. در صورت استفاده از وتیور به‌عنوان واحد تصفیه تکمیلی، زمان ماند باید حداقل 48 ساعت باشد زیرا ترکیبات آمونیوم، نیتریت و فسفات که عوامل محدودکننده استانداردهای تخلیه پساب و استفاده مجدد از آنها هستند، در این مدت با کارایی بیش از 95 درصد حذف می‌شوند. در این دوره مطالعاتی، میزان جذب نیتروژن و فسفر کل در برگ‌ها به‌ترتیب 17 و 3/2 میلی‌گرم در گرم وزن خشک و در ریشه‌های گیاه به‌ترتیب 13 و 8/1 میلی‌گرم در گرم وزن خشک بود. The aim of this study was to evaluate the growth of Vetiveria zizanioides under hydroponic conditions and its efficiency in removing nitrogen and phosphorus compounds from wastewaters. For this purpose, a pilot plant was constructed with a net volume of 60 liters which was intermittently fed for three months with the effluent from a domestic wastewater treatment plant. It was found that Vetiver exhibited a significant capability for living in polluted waters under hydroponic condition as evidenced by the growth of its leaves to 130 cm. Moreover, the average values of total nitrogen, total phosphorus, and biochemical oxidation demand (BOD) removal efficiencies over four days of retention time were 91%, 97%, and 75%, respectively. If used as a tertiary treatment unit, the plant needs a minimum retention time of two days to allow adequate time for the removal of such vital compounds as Ammonia and Phosphate by 95%, which is the typical standard limit for wastewater reuse or free discharge. Finally, it was observed that the total values of nitrogen and phosphorus absorbed in the leaves were 17 and 2.3 (mg/gr dry weight) while the same elements absorbed in the roots were measured as 13 and 1.8 (mg/gr dry weight), respectively. 1. Akarzadeh, A., Vakhshouri, M., and Arbabi, M. (2013). “An introduction of Vetiveria zizanioides as a novel approach for sustainable development and efficient water resource management.” Proc. 2nd National Conference of Environmental Planning and Conservation, Hamedan, Iran. (In Persian). 3. Troung, P., Van, T., and Pinners, E. (2008). Vetiver system application: A technical reference manual, 2nd Ed., Create Space Independent pub. Platform, UK. 4. Chomchalow, N. (2011). “Vetiver research, development and applications in Thailand.” AU Journal of Technology, 14 (4), 268 - 274. 5. Mickovski, S. B., van Beek, L. P. H., and Salin, F. (2005). “Uprooting of vetiver uprooting resistance of vetiver grass (Vetiveria zizanioides).” Plant and Soil, 278, 33-41. 6. Edelstein, M., Plaut, Z., Dudai, N., and Ben-Hur, M. (2009). “Vetiver (Vetiveria zizanioides) responses to fertilization and salinity under irrigation conditions.” J. of Environmental Management, 91, 215-221. 7. Klomjek, P., and Nitisoravut, S. (2005). “Constructed treatment wetland: A study of eight plant species under saline condition.” Chemosphere, 58, 585-593. 8. Truong, P., and Hart, B. (2001). Vetiver system for wastewater treatment, Technical Bulletin No. 2001/2. Pacific Rim Vetiver Network, Office of the Royal Development Projects Board, Thailand. 9. Liao, X. (2000). “Studies on plant ecology and system mechanisms of constructed wetland for pig farm in south China.” PhD Thesis, South China Agricultural University, Guangzhou, Gouangdong, China. 10. Jampeetong, A., Brix, H., and Kantawanichkul, S. (2012). “Effects of inorganic nitrogen forms on growth, morphology, nitrogen uptake capacity and nutrient allocation of four tropical aquatic macrophytes, Salvinia culcullata, Ipomoea aquatica, Cyperus involucratus and Vetiveria zizaniodes.” Aquatic Botany, 97, 10-16. 11. Minghui, L., Wen, Z., Yu, X., and Yongsheng, G. (2011). “Study on removal efficiencies of pollutant from constructed wetland in aquiculture wastewater around Poyang lake.” Procedia Environmental Sciences, 10, 2444-2448. 12. Boonsong, K., and Chansiri, M. (2008). “Domestic wastewater treatment using Vetiver grass cultivated with floating platform technique.” AU Journal of Technology, 12 (2), 73-80. 13. Fallahi, F., Ayati, B., and Ganjidoust, H. (2012), “Lab scale study of nitrate removal by phytoremediation". J. Water and Wastewater, 81, 57-65. (In Persian). 14. Chua, L., Tan, S.B.K., Sim, C.H., and Kumar Goyal, M. (2012), “Treatment of baseflow from an urban catchment by a floating wetland system.” Ecological Engineering, 49, 170-180. 15. Akbarzadeh, A., Jamshidi, S., and Vakhshouri, M. (2013). “Feasibility study of upgrading wastewater treatment plants using Vetiveria sp.” Proc. 3rd International Conference on Environmental Planning and Management, Tehran, Iran. (In Persian). 16. APHA. (2005). Standard methods for the examination of water and wastewater, 24th Ed., American Public Health Association, Washington D.C.
17. Landmeyer, J. E. (2012). Introduction to phytoremediation of contaminated groundwater, Springer Pub., New York. 18. Anderson, T. A., Gutherie, E. A., and Walton, B.T.(1993). “Bioremediation in the rhizosphere.” Environmental Science and Technology, 27, 2630-2636. 19. Duschenkov, V., Nanda Kumar, P. B. A., Motto, H., and Raskin., I. (1995). “Rhizofilteration: The use of plants to remove heavy metals from aqueous streams.” Environmental Science and Technology, 30, 1239-1245. 20. Jamshidi, S., Ardestani, M., and Niksokhan, M. H. (2014). “Upgrading wastewater treatment plants based on reuse demand, technical and environmental policies (a case study).” Environmental Energy and Economics International Research, (In Press).